Below are excerpts from some of the media outlets in which Cloud 9 Living has appeared. Hover over any of the logos below to read the full story! For the 6th straight year, Cloud 9 Living was named to Inc. Magazine's list of the fastest growing privately held companies in the U.S. with a 3-year revenue growth rate of 73%. Cloud 9 Living experience gifts stole the spotlight on the Today Show's segment for holiday gift ideas for adventure lovers. Chi-Lan Lieu and the ladies from The Talk made sure to include Cloud 9 Living experience gifts on their list of "Must-Give Gifts for Guys" this holiday season. Cloud 9 Living Executive V.P. was a guest on Varney & Co. to discuss the trends towards giving less "stuff" during the holidays, and the business behind experience gifts. Watch as Lionel Bienvenu from Denver 7 News' "The Now" goes for a flight lesson, and highlights a variety of holiday gift ideas from Cloud 9 Living. Check out the ladies of The Talk highlighting Cloud 9 Living as one of their top picks for Father's Day gift ideas! Cloud 9 Living named to Mercury 100 List of Fastest Growing Companies in Boulder County for 6th Consecutive Year. The audience of CBS' The Doctors went wild when they found out they were all being given a Cloud 9 Living gift certificate - just in time for Valentine's Day! For Ellen's "bonus day" as part of the 12 Days of Giveaways, she surprised her audience with gift certificates to Cloud 9 Living. Private ninja lesson from Cloud 9 Living is "a gift your loved one will definitely remember"
For the fourth year in a row Cloud 9 Living was recognized as one of the fastest growing private companies in America, with a 3 year growth rate of 94%. "Whether he wants to race a Ferrari, play a round with a professional golfer, or be a top gun pilot for the day, he doesn't have to dream anymore. Cloud 9 Living is the experience-giving gift that allows people to live out their dreams..."
For the fifth straight year, Cloud 9 Living was named to the Mercury 100 list of the Fastest Growing Private Companies in Boulder and Broomfield Counties. "Don't blow it this year. We'll help you score big this Valentine's Day with women-approved gifts for her that are guaranteed to please." For the third year in a row Cloud 9 Living was part of Inc. Magazine's fastest growing private companies in the U.S. with a 3-year growth rate of 92%. "Experience Gift Company Cloud 9 Living Ranked #26 on 2012 List of Fastest Growing Private Companies in Boulder and Broomfield Counties." "If Dad has more toys than the average 5 year-old, more clothes than the pages of GQ, and more gadgets than a Silicon Valley venture capitalist, you're not going to give him more stuff. Instead, give him the experience of a lifetime." In an effort to save parents the stress of shopping and college-bound graduates the disappointment of lackluster loot, the team at Huffington Post made their recommendations for the top gifts for the graduating class of 2012, and Cloud 9 Living experience gifts made the cut. "Taking hands-on to the next level is a company called Cloud 9 Living which is advertising a range of 'experiential' Mother's Day packages, including bull-riding lessons, a Cardio Strip Tease Dance Package and something called 'Fighter Pilot for a Day'..."
Amy Schlinger, editor at Shape Magazine, appeared on the Today Show to give her take on this year's hottest Valentine's Day gifts for men. Experience Gifts from Cloud 9 Living made the cut and were one of her top picks. Cloud 9 Living experience gifts were featured as part of Shape Magazine's Valentine's Day gift recommendations as a way to give the man in your life a Valentine's Day gift to truly get his heart pumping. "With Christmas Day looming, shoppers are running to malls to pick up sweaters for the siblings, slippers for Dad and a pair of earrings for Mom. But some are opting for a different kind of present altogether: experiential gifts." The crew from the Travel Channel visited Cloud 9 Living headquarters in Boulder, Colorado for an interview about what types of unforgettable experiences Cloud 9 Living has to offer families. The crew then documented a family enjoying our America's Cup Sailing experience on beautiful San Diego Bay. Cloud 9 Living for the 2nd year in a row was among Inc. Magazine's fastest growing private companies in the US with a 3-year growth of 111%. Cloud 9 Living, the Boulder-based provider of Experience Gifts across the United States, finished 17th on the list of companies with annual revenues greater than $2 million, reporting a 65.16% 2 year growth between 2008 and 2010. Advertising Age magazine examines the growing trend among consumers towards giving "experiential gift cards" from companies like Cloud 9 Living due to their creativity and the flexibility they offer gift recipients. Cloud 9 Living was featured on The Nate Berkus Show in this year's Holiday gift guide. Cloud 9 Living's Experience Gift Certificates were selected as one of the top holiday corporate gifts to give to clients by CNBC.com. Cloud 9 Living was ranked the 468th fastest growing private company in the US by Inc. Magazine with a 3-year growth of 642%. Gift giving guru Roby Spizman highlighted Cloud 9 Living and our Golf Lesson With a PGA® Pro experience as a great Valentine's Day gift idea. Click Here for the video clip. Cloud 9 Living took 2nd place in the Boulder County Business Report's annual ranking of the fastest growing companies in Boulder County. Click here for the article. Another site for great unexpected gifts is cloud9living.com. Surprise her with an aroma stone massage, surfing lessons or a gondola cruise. InterContinental has teamed up with a company called Cloud 9 Living to, among other things, offer its members the chance to fly an Italian-built fighter plane through simulated aerial combat (475,000 points) and swim with great white sharks 200 miles off the coast of Mexico (100,000 points). Cloud 9 Living, and founders Adam Michaels and John Augst, were featured on a holiday gift giving segment that showcased our Dig This!, Weightless Flight and Fighter Pilot for a Day experiences. 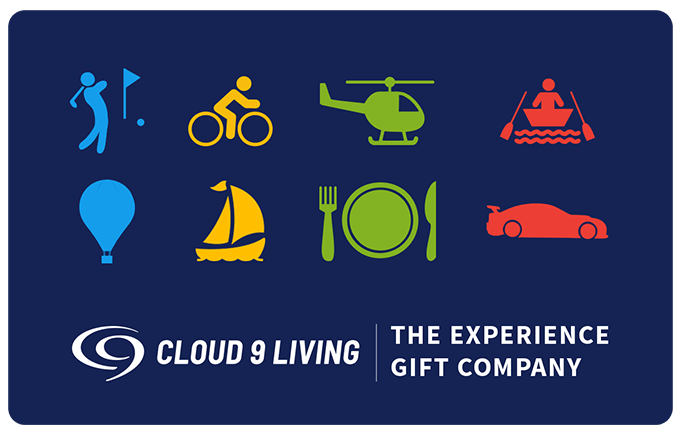 "An experiential holiday Christmas gift can have much more intense and lasting impact on the recipient..."
"Cloud 9 living is a wonderful way to give a personal gift to somebody who would never buy it for themselves." "Any other day of the year, an ugly sweater or a cheap-looking pair of earrings is just further evidence of your poorly developed shopping skills. On Valentine's Day, it becomes a "symbol of our relationship." Get it wrong, and it may be your last… Cloud 9 living will come into your home and prepare a gourmet meal, with matched wines." #31 - Cloud 9 living. "Launched nationwide in September, the company offers everything from driving a dog sled to diving with great white sharks"
"Instead of sweaters, toasters and paperweights, many adults will be receiving surfing lessons, parachute jumps, spa visits, gourmet meals and exotic vacations as gifts this year. Cloud 9 was founded to accommodate what Adam Michaels (CEO) saw in this country as "an overall shift in society from wanting material possessions to wanting life experiences." "Sign up for horseback riding, wine tasting, hot-air-ballooning or sailing at www.cloud9living.com"
"Welcome to the 21st century of gift-giving. Overwhelmed and overstuffed with shirts and slippers and games and gadgets, more Americans are eschewing traditional presents and giving life experiences for the holidays." It Beats a New Tie! "Instead of giving your esteemed employee a poinsettia for a holiday gift, this year opt for a night-vision Hummer tour or an aerobatic glider ride. Cloud 9 living, a Boulder-based company, offers an array of "experience gifts," a more visceral delight for recipients than a predictable wrapped and ribboned "thing."